Great fall blooming perennial! 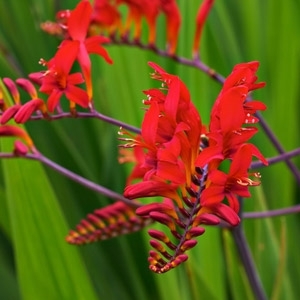 No late summer flower garden is complete without Crocosmia's vibrant wands of scarlet, red, orange, and yellow. They offer a late pop of color when many gardens are languishing in the dog days. The tubular blossoms beckon hummingbirds, and the seedpods that persist into fall also attract feathered visitors.